This demise of the democrats is a painful, infuriating, and maddening scene to experience but the chaos is the sure sign of the fall. Exposed for the raw savages that they are, anything that is about death, violence, and thuggery surrounds them, they wear it like a badge. They are no longer ‘liberals’, ‘democrats’, or Americans. The face they show us today is nearly demonic. All-out assault against the duly elected President of the United States. We have never experienced anything like this in our history. Treason & sedition at the highest levels of office throughout many departments [F + D]. Propaganda arm [FAKE NEWS MEDIA] of the D party in full attack mode (no facts, only statements). Propaganda arm [FAKE NEWS MEDIA] of the D party prevent-limit ‘sheep (you)’ from learning the TRUTH. Propaganda arm [FAKE NEWS MEDIA] of the D party retain-control of NARRATIVE (control over you). House D’s in full attack mode (no facts, only statements). Senate D’s in full attack mode (no facts, only statements). Fear of the public learning the TRUTH? Bribes, blackmail, threats, etc. all being deployed. Do NOT let them intimidate or silence you. Do not let them ever forget what they now stand for. SHAME! Excellently written Dr. Kate, you’ve pinned the tail of the donkey smack dab in the center of the DNC’s forehead where it belongs. The following States plus the District of Columbia have already signed onto the NPV State Compact. Notice that every one of these states voted for Hillary Clinton in the most recent election. The states are listed with their number of electoral votes: California 55, Connecticut 7, District of Columbia 3, Hawaii 4, Illinois 20, Maryland 10, Massachusetts 11, New Jersey 14, New York 29, Rhode Island 4, Vermont 3, Washington 12, and Colorado 9 equaling 181 electoral votes. This means that according to NPV Compact they are more than 67% of the way to their goal or just 89 electoral votes short from putting the Compact into effect! If only a portion of the additional states not listed above voting for Hillary passed the NPV Compact, it would go into effect. This NPV is way too quiet thus far– if it were to come to pass, it would be the death of our Constitutional Republic and our world as we have known it. This must never happen !! This NPV Compact mess is most upsetting–I completely screwed up an entry earlier after reading TJ’s message. If this were to become a reality it would be the end of our Constitutional Republic and the end of America as a viable country–this must never come to pass !! It was a great interview!!! I just can’t stand listening to these radical liberals degrading our POTUS — they have no idea what they are even talking about. Not one of them learned anything in school about the Holocast or WW1 or 11 or anything else. They are blinded by total hatred of him and what he stands for. If they hate America so much why dont they just pack up and go to a socialist country where they will have their unicorns and utopia. Make no sense but it is dangerous. Excellent NNN well said—who is this guy? 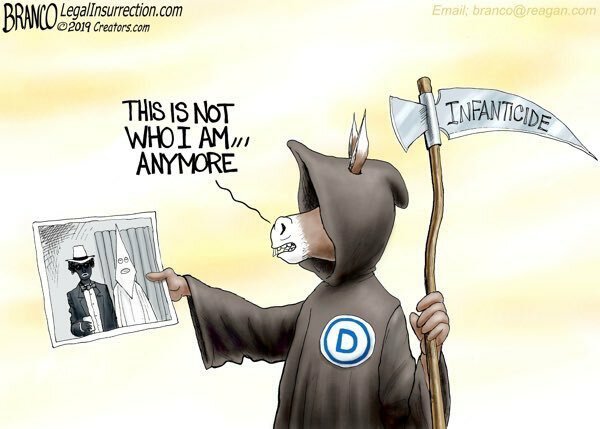 From Roy Rogers to infanticide. I’m aging myself by saying I watched Roy Rogers and Dale Evens every week and loved them. It’s sad that they have closed his museum. It;s sad also that kids today never even heard of Roy Rogers. A few years ago I bought a movie which was the original Lassie movie and it is a beautiful story. I have not been able to get one grandchild to even watch it. They don’t know who Lassie is and don’t want to know. OT-we need to get Hillary to run and knock these dem women off the ticket–Kamala, Tulsi and the Castro brothers are not natural born citizens and no one will vet them or remove them, anymore then they took obama off. However if Hillary decides to run she will win and run again against Trump and we know he will win. We can’t afford to take a chance with these other women — the MSM is pushing Kamala and she is ineligible. It would also put Cortez back in her barroom and out of office. Hillary is what she is and we all cant stand her and dont want her but she will never win against Trump. none of these people will win against trump, and Hillary’s time is up. She is going to jail. if she’s even still alive. Some think she isn’t. Of course they wouldn’t admit it if she were dead. They would run her corpse. I know she’s done Dr Kate….it would be so hysterical watching her take all of them out though and then watching Trump squash her again! see the last video with cortez–this is scary—these anti americans. Omar and Cortez are extremely racist. Note also Cortez disrespects our Potus — calling him Trump as if his name is poison to her nasty mouth. I’ve read that AOC was introduced to further Trump’s re-election in 2020. I watched the entire 2 hrs of Trumps speech at cpac yesterday and I love when he takes his notes out of his pocket and talks from his bullet points instead of the teleprompters. I even had my youngest son from MD watching with me while he was here for the weekend…. (and he hates politics but loves Trump). Great things are about to happen and this is why the liberals are trying to impeach him before he can destroy them—but the funniest thing is watching the dems eat each other! The moderate dems voting with the gop and cortez threatening them with a list to primary them until they are all gone. Do these communists think they can actual destroy this man with all their bs–i hardly think so, all they can do is call names and make threats. Time for them to feel the wrath of our Lord! I watched a video of Michael Malkin and she was fantastic. Hummm. I’ve not vetted this as I only found it on this video. more slave owners and today Kamala Harris’s father came out with his past of slave ownership and he isnt a black man he was born in Ireland. correction it wasnt her father who was born in Ireland it was his great grandparents. regardless they were still slave owners. There area lot of untruths in that article. He wasn’t raised in Chicago and there is no proof his mother was ever married to the Obama man. I never thought he was born in Kenya. It all comes down to the fact that we really don.t know who he is yet. I don’t believe in abortion but there are some women in history who I believe should have had abortions for the betterment of the world, and his mother is one of them. This was supposed to go with the article about Obama. what a fantastic move Trump just did for Palistine! I agree and we should demand the unsealing of obamas secret documents that are hidden in his new library in Chicago!..If the libs rats can crap all over Trump its time we repay the favor! Trump always knew obama was a fraud. I remember back in 09 how Trump would call into the fox and friends morning show and talk via phone and constantly talk about obama and how illegal he was. So Dr Kate do you really think Trump has everything on Obama? If he does thats dangerous for him. Have not seen that about Kim…remember the main stream media is lying to you, including FOX. Vet everything! Do your own research! could this be why aoc was playing good cop bad cop with the 3 agents sitting at the table while she questioned them in congress? sure sounds like it, after all she did ask if one could get rich without working for it and that was when the one agent said only if you could live with yourself. However he said that well before this came out and now we all know she did this and was part of it and it will come out and hopefully she will be thrown out of congress into prison. It will be very interesting to see how Nancy handles the two “duely” elected rep.s that are proving to be embarrassing –if she cans them, she’s got dem state voters to please, if she doesn’t respond she’s got party dems to answer to—Hot dog !! Word is that AOC and her so called chief of staff will definitely pay a huge fine and quite possibly do jail time for campaign finance fraud. AOC said that her chief of staff is a math genius — but no one is to big to fall. AOC said she plans on taking Trump down! How pathetically embarrassing that aoc and the 2 muslims were never vetted before they were sworn in. Nancy is a joke and she is allowing her party to eat each other up over so much hatred for Trump and regaining power the dems will never be trusted again. What they are doing to Trump is illegal and out of their jurisdiction – they have gone off the deep end. No KIM is NOT doing this!!!!! Media is making stuff up…to undermine Trump. You can be nearly 100% sure the deep state and media allies are making this up. Thanks Dr Kate for the video! someone needs to get her out of politics asap–she is dangerous to America. I would say that Melissa Francis nailed AOC! I am speechless to think that a member of congress would flat out say the Holocaust survivors are less important than a refugee that came to the US at the age of 4 yrs old with her family to live a life if freedom without gas chambers and death camps! My hope now is every jewish voter turn to Trump and denounce the dems. These democrats are done. Whoa–she takes obama to the wood shed! She was 4 yrs old when her parents brought her here from kenya where they lived (so she says) as refugees. She says she became an american citizen but its obvious she has no allegience to America. Her and aoc and talib are destroying the dem party and Nancy is allowing it. Didn’t the muslims say they would own America buy infiltrating every corner of our government until only muslims ran us! Oh yes I remember well reading those words. These 3 are totally anti american and need to be kicked out of congress and not be allowed to ever hold any office again. They are evil. I guess Nancy is terrified of them and has no idea how to handle them. Heather–patriots knew this was happening esp. since patriots started addressing dual citizenship within our CON..gress years ago. Heather, the problem is that none of our government will listen to any of us lowly citizens. I wish I had a lot of money and I could own all of Jon McNaughton’s paintings. I’ll have to settle for just one. that is a nice one! It’s heart breaking to see our dear President standing alone ah but he is in the presence of our Lord in prayer. Heather, this has been happening for years. Pope called for all catholic, others, to join with all religions in that we all serve the same God….he said we, Muslims, basically believe same doctrine. He had a speaker touring world wide and at that time I said I thought the Pope was one of the anti-christs. He has promoted One World Religion a long time. America could never sustain univeral healthcare.